Curva End Table. Shown in cherry. Curva Console, Coffee and End Tables. Shown in cherry. Curva Coffee Table. Rendered in white oak with Newton finish. 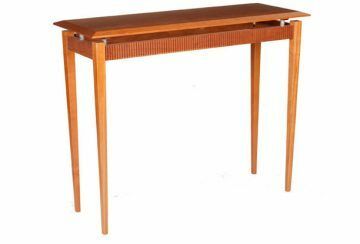 Curva End Table, shown in cherry. Curva Console Table, rendered in maple. The arching legs of the Curva Tables create graceful shapes and dramatic spaces. The lower glass shelf is standard in the Curva Coffee Table and the Curva End Table. The Curva End Table base is created with a 6-point dovetail.